Senator Richard J. Gordon welcomed the assurance from the House of Representatives' leadership that they will prioritize the bill that imposes bigger plate numbers for motorcycles as a preventive measure to address the unabated killings perpetrated by gunmen on board motorcycles or what the police formally call as motorcycle-riding suspects. Gordon said both House Speaker Pantaleon Alvarez and House Justice Committee Chairman Reynaldo Umali assured that they will prioritize passing the House' version of Senate Bill No. 1397 or the Motorcycle Crime Prevention Act of 2017. The said measure was passed on third and final reading in the Senate last year. "We had an impromptu caucus, so to speak, during the celebration of the 117th Anniversary of the Office of the Solicitor General. SP (Senate President Vicente Sotto III), Speaker Alvarez and Cong. Umali were also there and we had a sort of 'impromptu caucus.' The Speaker and Cong. Umali, who is my counterpart in the House, assured me that they will prioritize the House version of my bill," the principal author and sponsor of SBN 1397 said. Gordon's measure proposes to require bigger and more readable plate numbers for motorcycles to deter, if not totally stop, crimes perpetrated by criminals on board motorcycles. Salient features of SBN 1397 includes mandating the Land Transportation Office (LTO) to issue bigger and reflectorized license plates to every motorcycle and scooter in the country which must be placed in both front and rear parts of the motorcycle. The measure also proposes to sanction owners of motorcycles used in the perpetration of crimes with fines and jail terms. 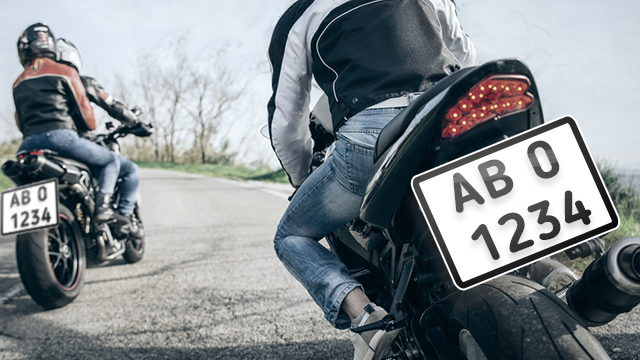 Should a motorcycle used in committing a crime turn out to be stolen or owned by another person other than the perpetrator and the owner failed to report the loss immediately, he or she will also be meted similar sanctions. Motorcycles travelling without plate numbers will also be flagged down. "Almost daily, nakakabalita tayo na may pinatay ng riding-in-tandem - pati mga pari, barangay officials at iba pa nasama na din sa pinapatay. Hindi mabigay ng mga witnesses ang plate number dahil sa sobrang liit kaya madalas nakakatakas yung mga gunmen. Kahit may CCTV footage, hindi pa rin makita yung plate number. Kung lalakihan ang plate number, madali itong mababasa ng mga witness. Pwedeng mairadyo agad sa mga malalapit na police station na harangin nila yung motorsiklo na ginamit. Matatakot na din ang mga masasamang-loob na gumawa ng krimen gamit ng motorsiklo," Gordon explained as he condemned the killings. Many high-profile killings have been carried out across the country through riding-in-tandem shootings in the last two decades. This year alone, among those killed were: Jonah John Ungab, vice mayor of Ronda, Cebu and lawyer of alleged drug lord Kerwin Espinosa, who was killed near the Cebu City courthouse while aboard his car; retired Ozamiz City prosecutor Geronimo Marabe Jr.; and 37-year-old priest Fr. Mark Ventura was shot dead after Sunday Mass. In the past years, some of those killed by riding-in-tandem gunmen included Judge Henrick Gingyon, a Pasay City judge who was killed in an ambush in Bacoor, Cavite; lawyer Augustus Cezar, PUP vice president; Michael Marasigan, former Businessworld World journalist who was killed in San Juan along with his brother; and Judge Voltaire Rosales, the regional trial court judge who convicted drug dealer German Agojo. Like, follow and subscribe Richard J. Gordon official social media accounts and get the latest updates.